I've been getting better at cleansing my face at night with a dedicated cleanser instead of just soap and water. I've also been doing pretty well at using serums and moisturizers. But, I have forgotten all about those dead skin cells that are just hanging out, clogging my pores, and making my skin look dull. 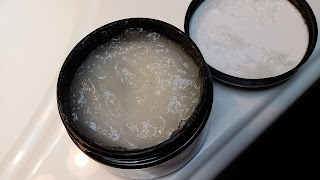 Every now and then my face needs a good scrub to refresh and renew the top layer of skin. I opened the scrub for the first time and I was greeted with a wonderful, relaxing scent. The scrub looks like a clear to grayish gel. I don't know if you remember how the Valentia Ultra Plumping Hydration Mask looked like pudding? The scrub has kind of that same consistency, except that it has the jojoba exfoliating beads in it. What I was surprised the most about when I was done using the scrub is how moisturized my face felt. I expected it to feel soft because of the dead skin cells being gone. I didn't expect it to be SUPER soft because it was also moisturized. I guess I always think of the exfoliating process and the moisturizing process as being two different steps, completely independent from one another. 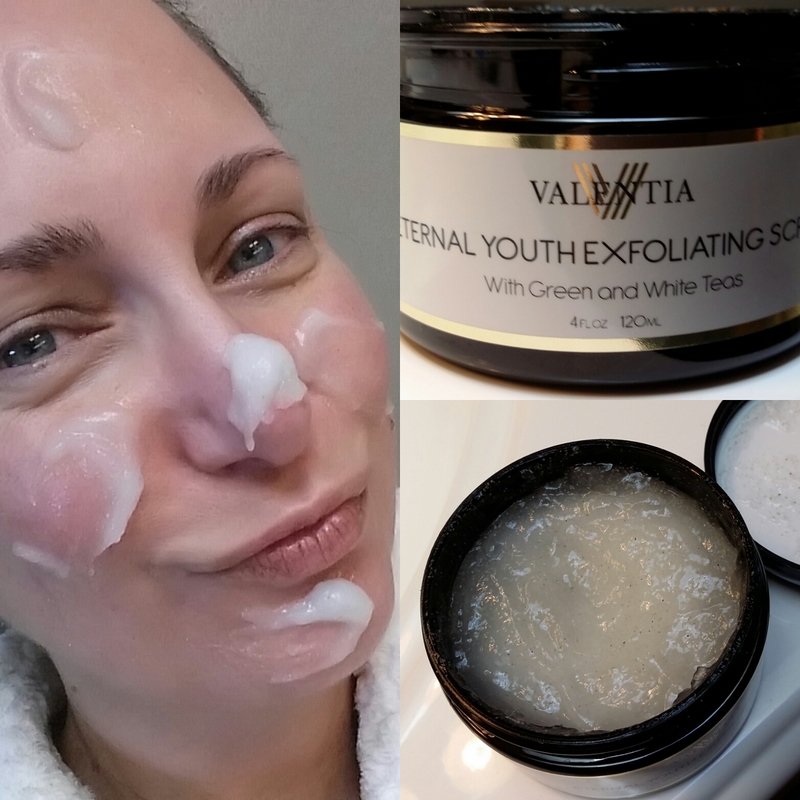 For me, it was a bonus that the Eternal Youth Exfoliating Scrub did both! The scrub doesn't dry my skin out. I know that the price on the Valentia products seem like they might be a little high to some people. 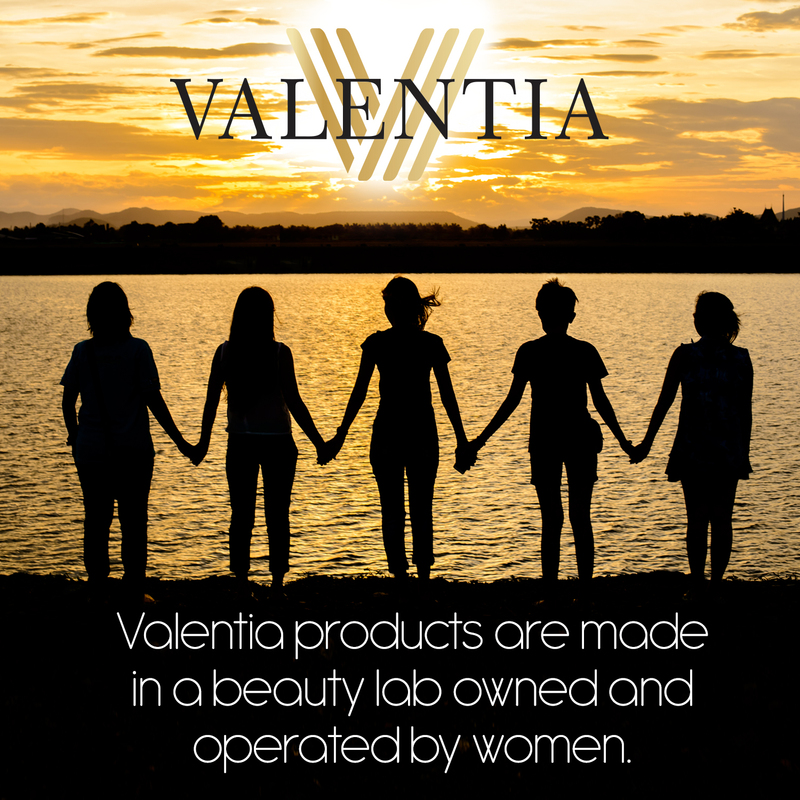 Valentia calls their products "luxurious" and they really, really are. 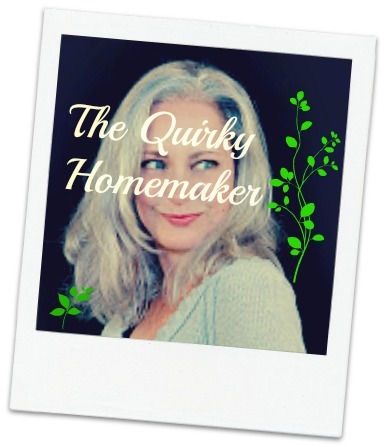 They are made with natural ingredients and they make me feel special. It's nice to have these products to take a little "me" time and spoil myself. 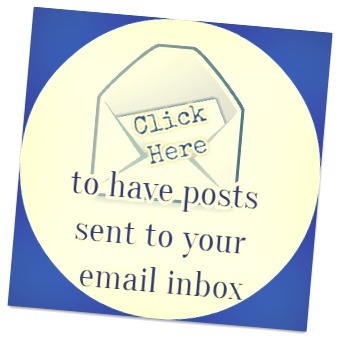 In my experience, the products go a long way, too. You only need a little bit at a time and the scrub will last 18 months. . . . . if you don't use it all up quicker than that. I was talking about how relaxing the scrub smells. Sometimes I just open up the lid and take a big whiff. So relaxing! Green and White tea-- act as antioxidants that provide anti-inflammatory, anti-irritant and anti-aging effects. Aloe Vera-- moisturizes and improves skin's firmness. Jojoba beads-- exfoliate and remove dead skin cells. Olive, Avocado & Kukui Butters-- rich in vitamins A,B,D & E to help nourish, hydrate and repair the skin. 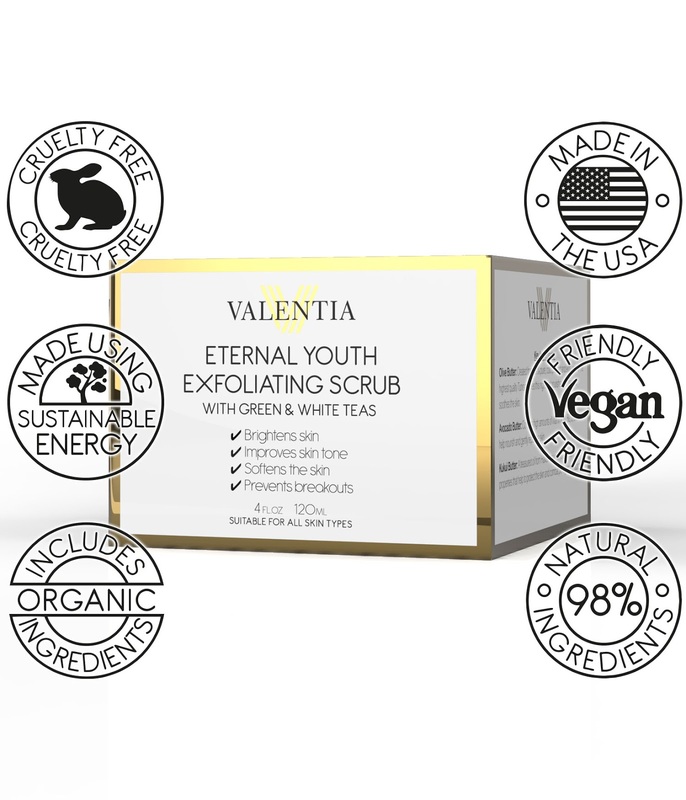 The Eternal Youth Exfoliating Scrub is Paraben and Alcohol free and made in the USA by a Women-led company! I love it and plan on trying to use it at least once a week, maybe twice a week if I remember! How do you exfoliate your skin? 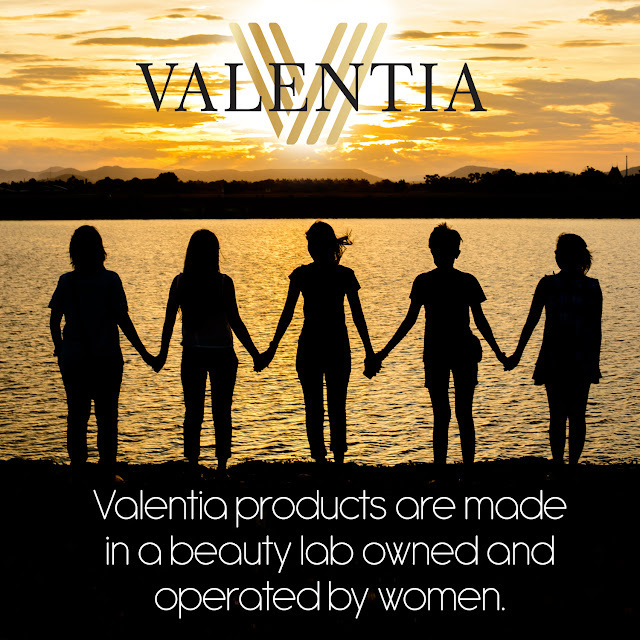 Have you ever used any of Valentia's products? I have been really impressed.